Turf grass lawns require lots of maintenance—watering, the burning of fossil fuels for mowing and other upkeep, pesticides, and fertilizers—which impact water quality and can contribute to climate change. Many of the non-native, ornamental plants we plant in our gardens have little value to wildlife. Some of these flowering ornamental plants produce no nectar or pollen for bees or butterflies. You can play an important role in helping to preserve species and biodiversity in your own yard by landscaping and gardening with native plants. Replacing turf grass and non-native plants with natives—even in small sections of your yard or garden—pays big environmental dividends! Planting a variety of native plants increases biodiversity. We need biodiversity—it runs the ecosystem on which we depend. Native plants provide food and shelter for wildlife. 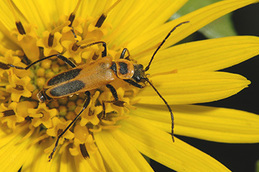 Many insects require a specific host plant to lay their eggs on and the young to feed on (e.g. monarchs and milkweeds). Animals require many different plants throughout their life cycles to remain healthy and robust. Native plants are adapted to the local climate and soil conditions where they occur naturally. Many native plants have deep roots, and require little to no watering once established. These deep roots decrease erosion and filter stormwater, nutrients, and pollutants that would otherwise end up in our lakes, ponds, wetlands and streams. Learn what you have. This will save you time and energy later on. Learn to distinguish non-native weeds from native plants. Manage the aggressive, perennial invasive plants that will compete with the native plants for space, water and nutrients. Leave or transplant any native plants you might already have in your yard. Start small. Perhaps you have an area of your lawn or garden that needs a re-do. Areas of lawn where grass doesn’t grow well or that you are tired of mowing are perfect candidates to get you started. Reduce some areas of turf and add a pollinator garden or a raingarden. Pick the right plants for the right place. Native plants come in a variety of colors, shapes and sizes. Some plants grow well in full sun with sandy soils, others prefer wet soils or shady areas. Variety is the spice of life. Try to have plants that flower in succession—different plants that bloom from early spring all the way through to the fall. Plant a variety of different types of plants—flowers, grasses, sedges, shrubs and trees. The larger variety of plants you have will support a larger variety of life. Avoid neonics. Neonicitinoid pesticides are systemic pesticides that are taken up within the plant. There is mounting evidence that neonics are harmful to pollinators and other beneficial insects. To avoid harming beneficial insects, ask the retailer before purchase if plants have been treated with systemic pesticides. Native landscaping doesn’t have to look “wild.” You may prefer a wild look. If you want a more manicured garden, plant selection is important. You can also utilize mulch, spacing, strips of grass, paths, and attractive fencing for a more formal look. Support local native plant nurseries and companies. 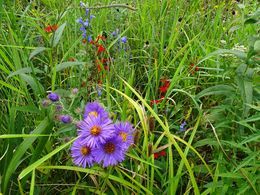 There are many great companies in Minnesota that specialize in growing or managing native plants/invasive plants. They have the expertise to give you some ideas of what plants might work for your situation. Native plant nurseries in your area will have grown local ecotype native plants—ones that came from your region that are adapted to local conditions. Be okay with bugs! Only a small percentage of insects are pests, and the damage they do is aesthetic and oftentimes tolerable. Insects form the base of the food web. Without insects, there can be no mammals, birds, reptiles, or other forms of "higher" life. “Free” money. 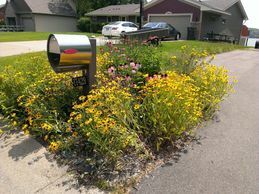 Many Soil and Water Conservation Districts, Watershed Districts, and cities provide cost-share money for people who want to help the environment by planting native plants in their yards. See http://www.bwsr.state.mn.us/native_vegetation for more helpful resources. Don’t have a yard? Consider adopting a local park or open space for planting natives. Be sure to ask for permission first. Or support non-profits and other organizations that are doing this type of work. If each of us does a little bit, we can make a BIG difference! http://www.wildones.org/. Non-profit organization dedicated to native plant landscaping. Seven local chapters in Minnesota. http://www.pollinatorsnativeplants.com/. Pollinator and native plant education. https://www.minnesotawildflowers.info/. Online resource for Minnesota plant identification. https://mnnativeintelligence.com/. Clearing house of native plant information. http://www.dnr.state.mn.us/gardens/nativeplants/index.html. DNR webpage about native plant landscaping, native plant companies, and more. https://www.pca.state.mn.us/news/bring-back-pollinators. Anyone with a garden — no matter the size — can help restore the bee population by creating a bee-friendly garden. MPCA website provides steps for getting started. http://www.bringingnaturehome.net/. Website for the book “Bringing Nature Home” by Douglas Tallamy, considered by many to be a must-read book about wildlife and native plants. Native plants for sustainable landscapes: Establishment and management of lakeshores and gardens. Detailed information on native plant benefits, plant selection, and site and other considerations. Developed by Center for Urban Ecology and Sustainability, University of Minnesota. Landscape Revival: Native Plant Expo and Market. This weekend! Buy native plants from many different vendors, learn from experts. Saturday June 4, 2016, 9 AM – 3 PM. Community Pavilion at the Roseville Cub Foods, 1201 Larpenteur Ave W, Roseville, MN 55113. Minnetonka Native Plant Market and Eco Fun Fest. Purchase native plants, talk with experts from local organizations, and enjoy fun family activities. Wednesday Jun. 08, 2016, 3 PM - 7 PM. Minnetonka City Hall, 14600 Minnetonka Blvd, Minnetonka, MN 55345. Water Wednesday: What You Can Do for Pollinators. Wednesday, June 8, 6 PM - 7:30 PM. Mississippi Watershed Management Organization, Minneapolis. 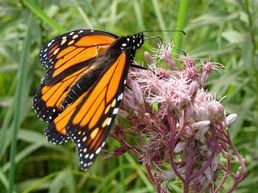 Join Mississippi Watershed Management Organization for the first in a three-part summer series, "What you can do for pollinators: creating a pollinator friendly garden habitat." Workshop presenter Heather Holm owns a Minnetonka-based landscape design and consulting firm specializing in pollinator landscapes and native landscape restorations. For more information or to register: mwmo.org/ workshop. Minnesota GreenCorps - Apply by June 3! Know someone looking for experience in the environmental field? Minnesota GreenCorps has 40 positions available statewide! Check out our project summaries to learn about the 40 positions. 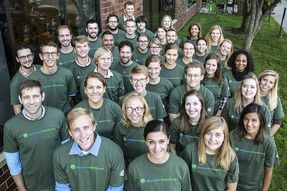 Minnesota GreenCorps is an AmeriCorps program, coordinated by the MPCA, which places AmeriCorps members with organizations around the state to spend 11 months addressing environmental issues and building community resilience. All positions begin on September 14, 2016. More information on the program is available here. Member activities include but are not limited to: environmental education and outreach to people of all ages, mobilizing volunteers, implementing sustainability-related projects, collecting, benchmarking and analyzing data, measuring environmental results, field work, collaborating with local officials and community members, and much more. In addition to gaining valuable skills and experience in the environmental field, members receive a living allowance, an offer of health insurance, and loan forbearance. Upon completing the program, participants receive an Education Award which can be used to pay off qualified student loans, or to finance future education. The member application and guidance document are available at: www.pca.state.mn.us/mngreencorps. Completed member applications, along with a resume, must be submitted to mgcapplication.pca@state.mn.us by the deadline of June 3, 2016. Operation of the 2016-2017 program year is contingent upon receiving funding. Always Ready: Using solar and storage to enhance community preparedness. Communities and organizations across the country, including Minnesota’s own Camp Ripley National Guard site, are creating models for how solar energy can enhance community preparedness and security, especially in times of emergencies. Join Fresh Energy for a conversation with Michael Burr of Microgrid Institute and Jennifer Peterson of Minnesota Power about how solar, storage, and microgrids can help Minnesota become more prepared and secure. Wednesday, June 15th, 7AM—8:30AM, Town and Country Club, 300 North Mississippi River Blvd, Saint Paul, Minnesota 55104. Register at : http://ow.ly/Y5OXf. Registration ends June 9th.